Zen Hair Extensions : New to Angels Twelve. At Angels Twelve we do our research to ensure that all our products and meet the high standards expected by our valued clients. When we sought to offer hair extensions we looked at the best out there. Zen Hair Extensions was the very best of what we tested. This trusted, UK-based company met all our requirements on quality, durability and that all important finished look. To celebrate this new service, we are offering 10 lucky customers 2-for-1 on 18-inch and 22-inch hair extensions. The first 10 customers will be offered the chance to bring a friend and split the cost. Three hours of pampering, bubbles and freshly ground coffee! This amazing offer will only be open for the next two weeks so don’t miss your chance to save 50% on the cost of new extensions. How are extensions fitted to my own hair? 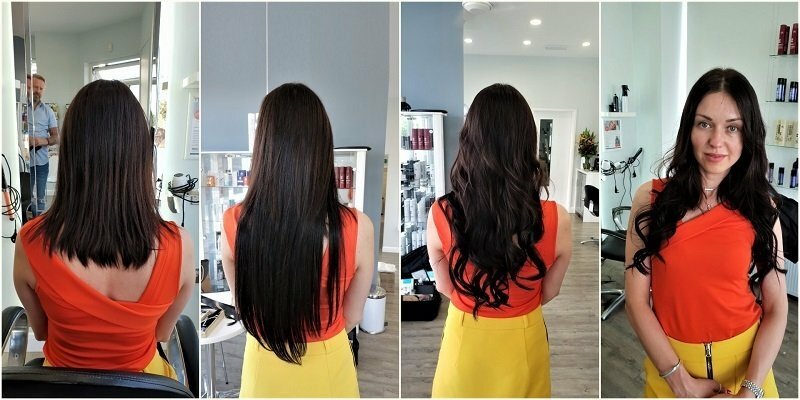 There are three different ways for fitting Zen Luxury Hair Extensions. U-Tips: a popular method for adding hair extensions that will keep the hair in place securely for several months. U-Tips uses a Keratin bond, a natural component of real hair, to bond the extension to your own hair. This method allows the hair to be re-used during follow up appointments. I-Tips: use a tiny alloy rings (the micro-ring) that are compressed around the hair not requiring heat. These provide a strong and comfortable attachment. The micro-rings are lined with a silicone cushion to avoid the hair being exposed to excessive pressure. These bonds are easily and can be re-attached by replacing the micro-rings. Tape Extensions: quick and versatile this method of attaching hair extensions is becoming very popular. The hair extension comes fused to a soft, flexible strip. The extension is fixed to your own hair with medical-grade gel that can last for 6-8 weeks. Tape extensions are flat against your hair and can easily be removed. Where does the hair come from and is it real? We only use Zen Luxury quality extensions at Angels Twelve. The extensions are ethically sourced human hair. Zen hair is one of the biggest UK-based companies with all hair guaranteed to be 100% human hair. All hair is quality check and only used if not previously chemically treated (sometimes referred to as ‘virgin’ hair). We looked at a range of providers and Zen offered the best quality hair with a number of attachment methods our clients really liked. Which products should I use to maintain my hair extensions? Sulphate and silicone free shampoo are best for home use. Your stylist will explain this to you during your initial consultation and all aftercare is available here at Angels Twelve. You also need to maintain the hair quality with good quality, salon-grade treatments. 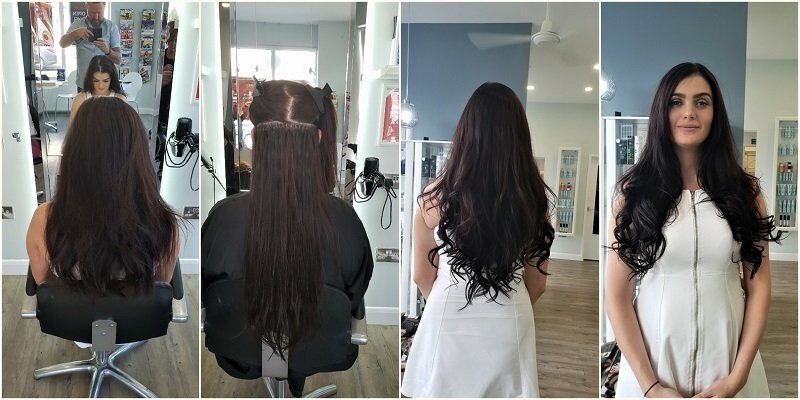 What lengths do hair extensions come in and how much is needed? The hair comes in a standard 18 inch (46cm) or 22 inch (55cm) bundle. The longer extensions cost slightly more. Of course, just like real hair they will be cut blended into your chosen style. On average most customers have between 2-3 bundles. The ladies on this page have all had 3 bundles of Zen Luxury each. Zen Luxury Hair extensions, when properly maintained, can potentially last between 6 and 9 months. As a rule you should avoid getting the extensions wet with sea water and chlorinated water, such as swimming pools. That doesn’t mean you can’t go to into a pool, just don’t get your hair wet! Normal wash/shampooing is fine. When can I wash my hair after the hair extensions have been fitted? A week after fitting we offer a free wash, blow dry and review with your stylist here at Angels Twelve. Great! I want to try some new hair extensions, what do I do next? Step One: Call the salon to arrange a free consultation. During this your stylist will take you through the options available. You will also have a patch test, a standard procedure to ensure you are not sensitive to the treatment. You will also decide on a colour for your new look. This will take 30 mins in total. Step Two: You will come to the salon for your exciting new look! This will take up to 3 hours to fit, cut and style your new hair. Step three: After one week you will come back for you free review that includes a wash and blow-dry. Here you will have a chance to ask your stylist any questions and review the care of your new extensions. An outstanding hair extension, both in look and durability. Our very best hair extension.Baby cuticle, virgin remi hair. A more dense hair extension with a double draw down ratio.